As a committed believer in aerobics, I was particularly stunned and bummed out by the death of Sheryl Sandberg's husband Dave Goldberg. Somehow he'd fallen off the treadmill and smashed his head. On a family vacation. Death so young is bad enough but I especially hate the idea that you can't have everything. So fades the notion of Sheryl Sandberg's perfect life. 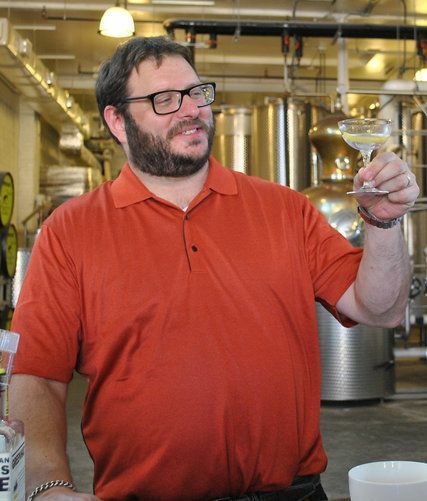 Josh Ozersky's death in a Chicago hotel room, just before the James Beard Awards, was shocking too. I cannot say I was surprised. I may not eat as if I believe fat clogs arteries, but I know it can. My guy and I used to go out to dinner occasionally with Josh when he was running Grub Street. I remember he thought my expense account was bigger than his and I should pay. He later became a food writer for Time and more recently for Esquire as well as his own blog, Feedbag. He hadn't yet become the grandiloquent eating obsessive he would ultimately become. He had not yet won uninhibited gourmands, unabashed fatties and circumspect gastronomes with his oversize enthusiasms and his passion for meat. We lost touch. I wasn't invited to the wedding. I had never attended his annual traveling Meatopia celebration. I would have loved to go and might have, with proper angst, tasted around. I did not know he had only recently moved to Portland. But I remember feeling he was tempting fate at his first signs of gout in 2009. He insisted he was elated. "What a triumph!" he wrote. "Of course, there is the physical downside...but what is the point of living in a city so rife with pork belly confits, foie gras-stuffed chickens, testa ravioli, Yorkshire puddings, and ramen bars?...I just want you, Feedbag readers, to know that I won't be altering my lifestyle at all..."
The death of wine merchant Bill Sokolin at 85 was a surprise too. I hadn't known he was still alive. We'd lost touch even before the historic moment when he broke the precious Jefferson wine bottle, and long before he moved to Amagansett. We met in the tasting rooms of Seagrams in the early '70s when the great wine makers of France came to show off their wares. Merchants who sold wine, and at least one restaurant critic, as well as wine writers were invited. 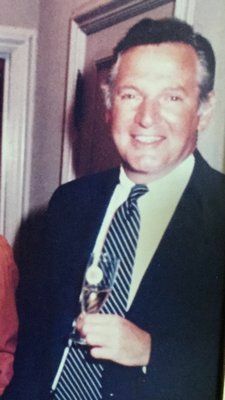 Bill was in love with wine and selling wine. He wrote poetry more or less in his sales letters. One evening he brought a mythic aged Barbaresco by Gaja to drink with our pizza. It was the greatest most ready-to-drink wine I'd ever tasted in an era when I was spoiled by so many great wines. We became co-conspirators when a young English wine merchant named Melvin Master announced he was bringing Paul Bocuse to New York and the chef would cook a dinner "just for us and a few friends," Sokolin confided. 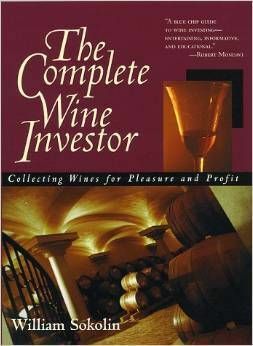 Later Bill Sokolin would go on to pretty single-mindedly invent wine futures and investing in wine. But at that point, he was the unlikely hero who told too many people about the promised dinner. Roger Yaseen, then the head of the Wine and Food Society moved in. It was agreed that the Society and the Four Seasons could cash in with their own dinners. Sokolin's Bocuse dinner for 12 became the "Dinner of the Century or "Trial By Pig's Bladder." Click here to read and laugh at our grand delusions. After a few days of so much death, we need to smile. I tried to capture the colors of grapes today to honor the departed and the survivors. Intense is not an exaggeration for George Mendes these first few nights of Lupulo, his new tavern and small-plates joint in Chelsea. He's everywhere, coaching a new recruit at the tasting station behind the bar on how to clean out the head of a lobster in the middle of dinner. Leaning out the open window from the kitchen to show us the oozing cloud of a classic Portuguese dessert just pulled from the oven. Racing to our table to deliver "espargos assados," grilled green asparagus with sea urchin, dried and fresh. Yes, the asparagus. We've had it already, we tell the chef. We used the crust of dense Portuguese cornbread we just can't stop eating to wipe up the sauce. (That would be the "broa" Mendes gets from a bakery in Newark.) 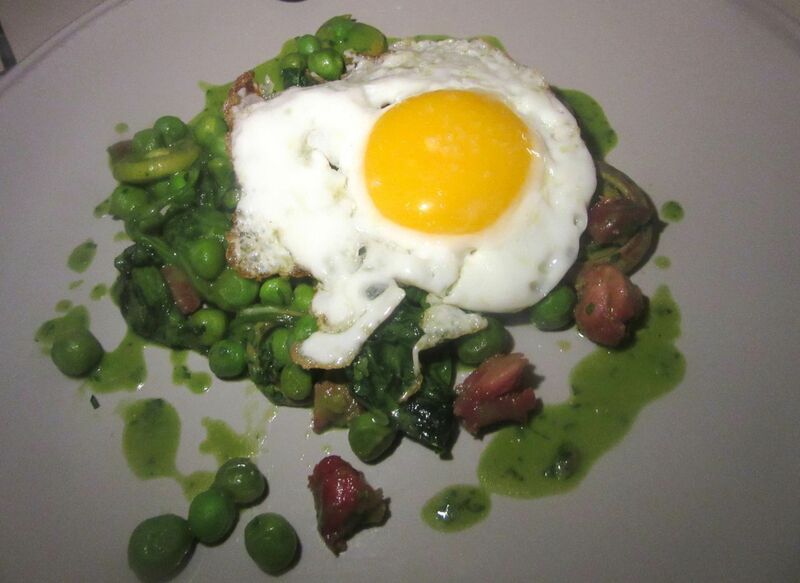 The lemony taste of sorrel and sea perfume plays with the green spring grassiness of the asparagus. I urge you to go now. Lupulo is already piling in. Come early for a place at the bar. Click here to find out what to order. 835 Sixth Avenue between 29th and 30th Streets. 212 290 7600. Meijin is a ramen joint that's takes pride in its starters. Koji Miyamoto's adjoining bar and bistro on the Upper East Side are just what you would want for a Japanese tavern in your own neighborhood. My friend Belle, a regular here, is our guru tonight. She comes by when it's quiet at lunch and there's a $10 special of ramen and a tempura dish. We must order the chef's smoky chili beef broth ramen, she says. We divide it into four bowls. With its nest of slippery thin noodles, bean sprouts, arugula, garlic chips, hot chili oil and the creamy beef broth, it's more compelling than the pork rib ginger special of the evening. As a ramen amateur, I had no idea that beef ramen is rare, till I googled around a bit. 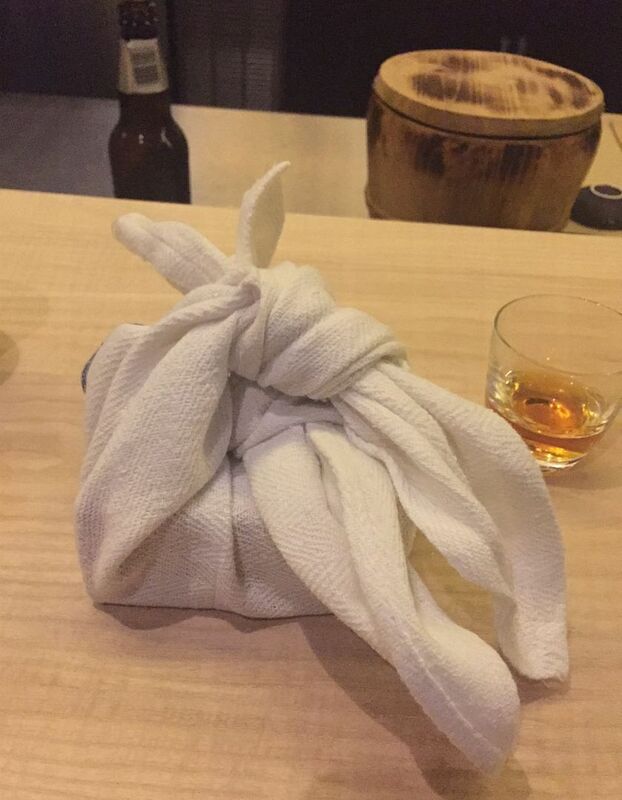 Miyamoto cooks 60 pounds of beef bones for 13 hours every day for this personal ramen tweak. 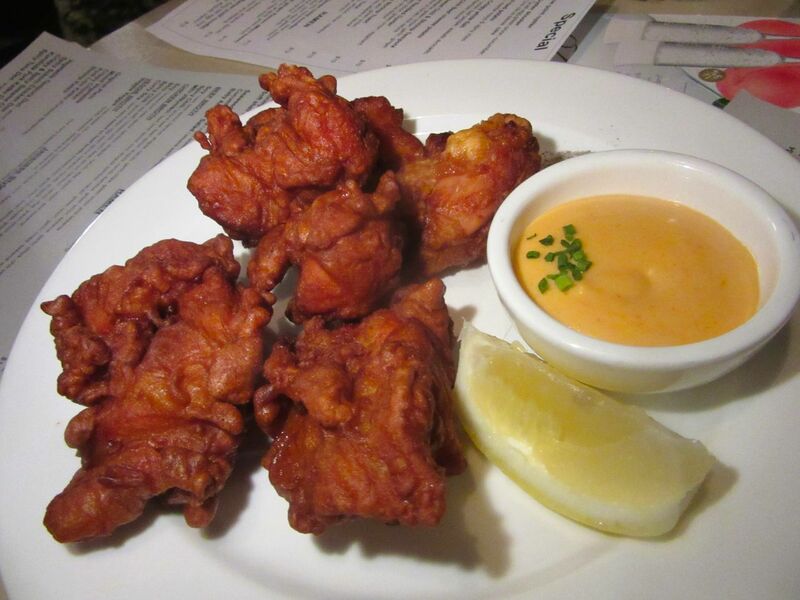 But the truth is, I would come back to Meijin just for the fried chicken, $8 on the Sea & Farm Small Plates list. It's juicy inside a delicious crust, with spicy mayo to dip it in and sansho salt to drag it through. A lemon squirt is optional. Click here to read more. 1574 Second Avenue between 81st and 82nd Streets. 212 327 2800. Restless in exile after losing their beguiling lace-curtained dollhouse in Central Harlem to a rent hike, Kenichi Tajima and his wife Keiko landed their avian-centric Mountain Bird as a pop-up last week on East 110th Street. I'd been totally smitten with the charming eccentricity of their delicious madness. Click here to read "Mountain Bird Soars in Harlem". And I was shocked to discover it had ended so rudely. Keiko confided how difficult it has been to find an affordable new home with an existing kitchen. So for now, this pop-up at Alexandra Morris' Tastings. Don't miss it. 251 East 110th Street, between Second and Third avenues. 212 744 4422. "One of Claude Monet's favorite dishes was a cod recipe provided by Cezanne." 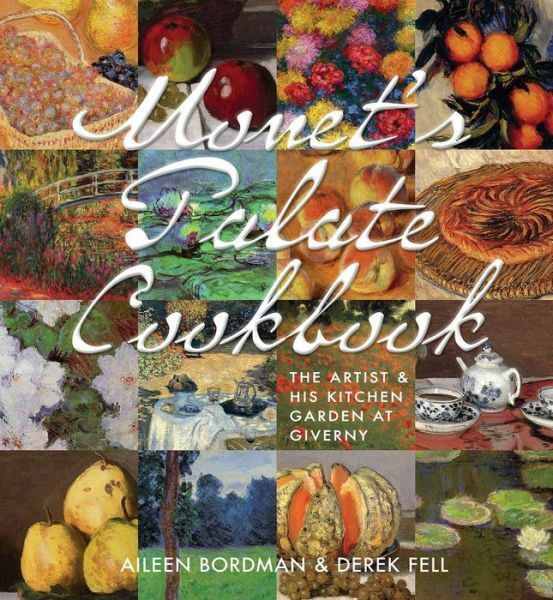 I flipped some pages in this unique book, "Monet's Palate Cookbook: The Artist and His Garden at Giverney" (Gibbs Smith $30), and there it was. A precious concept, a dish borrowed from Cezanne. Every Sunday, we are told, Cezanne would chose the vegetables from those selected for him by the gardener Florimond for what the authors call "The Sunday Pot," a vegetable soup. Aileen Boardman and Derek Fell have put together this unusual most intimate book from archives and memories. They seek to tie Cezanne's garden into our farm-to-table notions and maybe that makes sense. 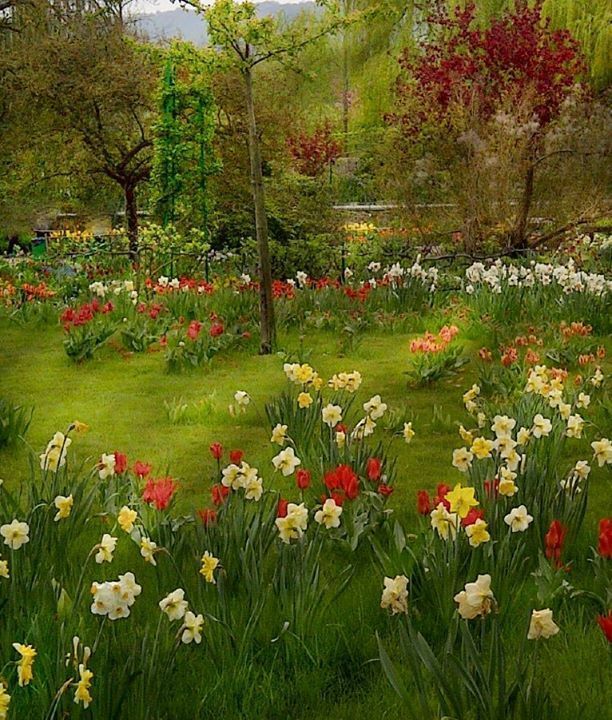 Clearly he was a fanatic, raising flowers not just to have blossoms to paint but planting and expanding his kitchen garden as his works began to sell and he could afford it. As in their film by the same name, the authors explore the interior of the artist's home and his domestic habits and where the photos can only suggest the riches of the film, there are recipes. Maybe you'll try the boeuf bourguignon with rosemary puff pastry crust. And maybe you'll just dream about it. There is a drawing of Fell's own kitchen garden that might inspire your own. Or even a row of pots on your windowsills. Meryl Streep has written the foreward. That's nice too since we know that in another life she was Julia Child. 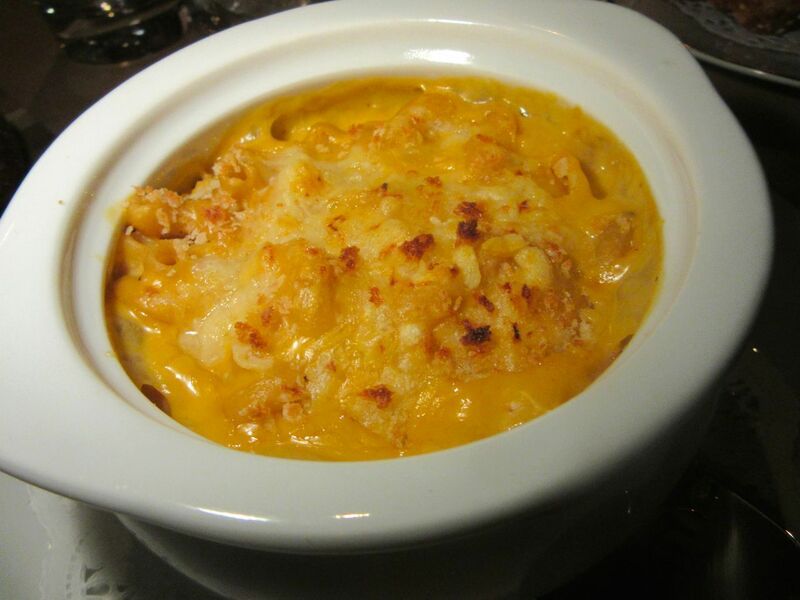 Photographs of Lupulo's garden peas with chorizo, Meijin's splendid fried chicken, Mountain Bird's shrimp bisque macaroni, and the photograph from Monet's Palate Cookbook, may not be used without permission from Gael Greene. Copyright 2015. All rights reserved.